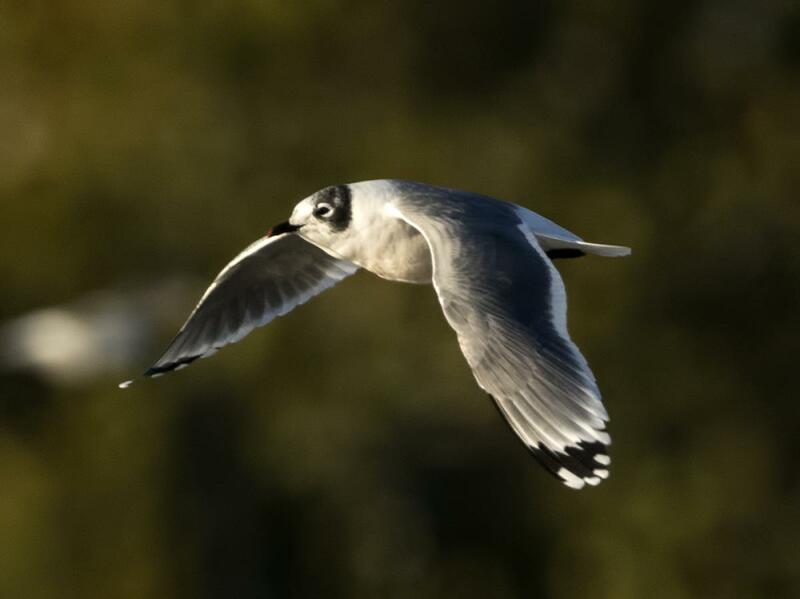 Franklin’s gull is a hugely abundant migrant that breeds in North America and spends the southern summer in South America. They may stray widely, however, and have been recorded four times in the New Zealand region. 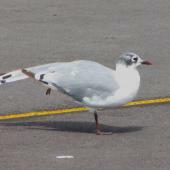 The best known individual turned up in the Manukau Harbour in September 2009 before shifting to a Papakura park, where it attracted the attention of many birders before it left in late October, after moulting its flight feathers. 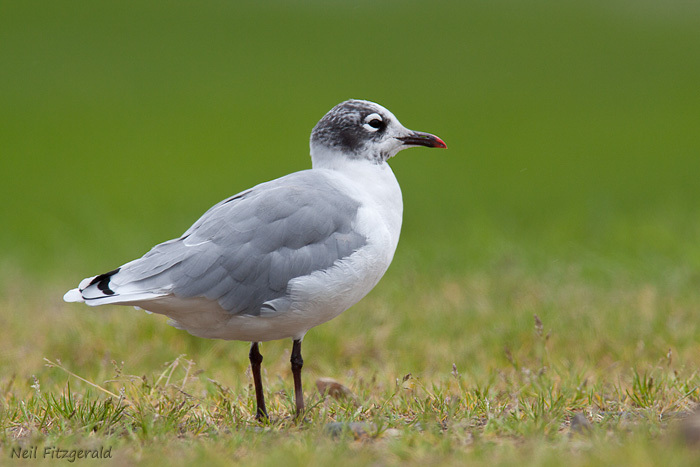 A small gull, similar in size to a red-billed gull, the most striking feature of a Franklin’s gull is the black on the head. 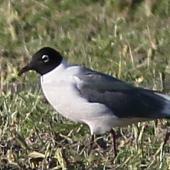 In breeding plumage the head is entirely black with striking thick white eyelids. 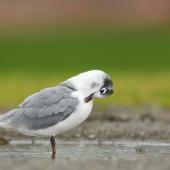 Even in the non-breeding season, large patches of black remain in a patch around the eyes and across the hind crown and upper nape. In breeding plumage the bill is mainly dark red but becomes blackish with a red tip in the non-breeding season. The legs are blackish. 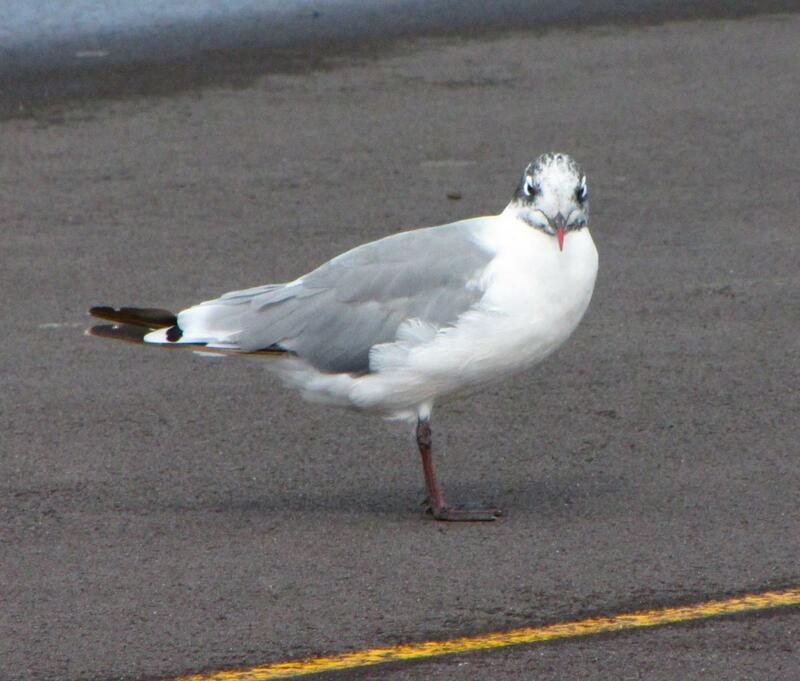 Apart from this the colour pattern is similar to that of other small gulls. 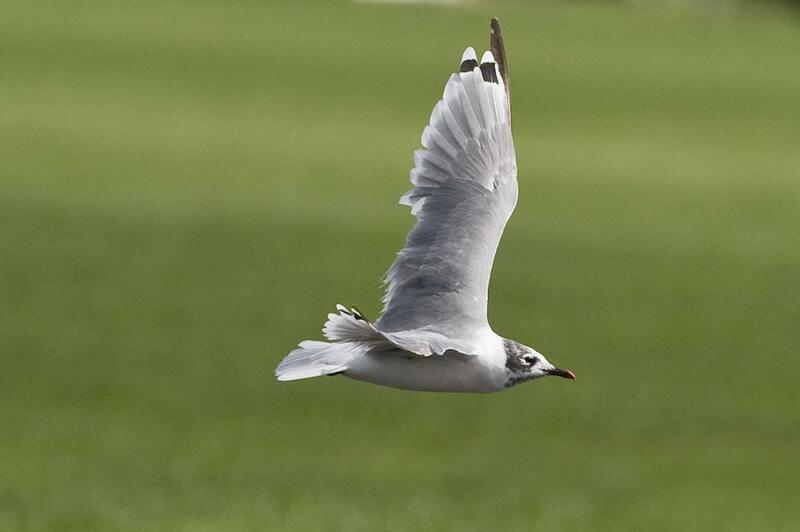 The back is darker slate grey than the red-billed gull; the neck, breast, belly and underwing surfaces are white. The upper surfaces of the wing are grey like the back with a white trailing edge and a distinctive pattern at the tips. 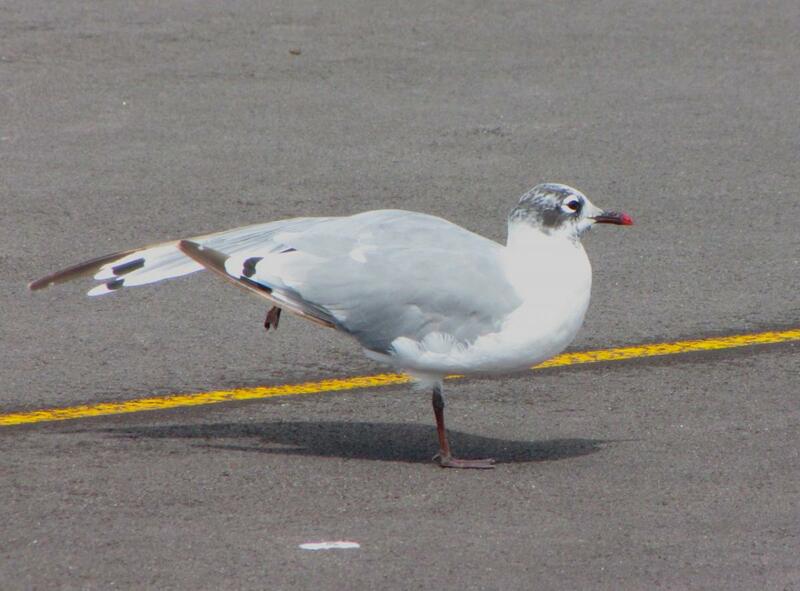 There is a black band across the end but the flight feathers are tipped white and there is another whitish band on the inside as well. 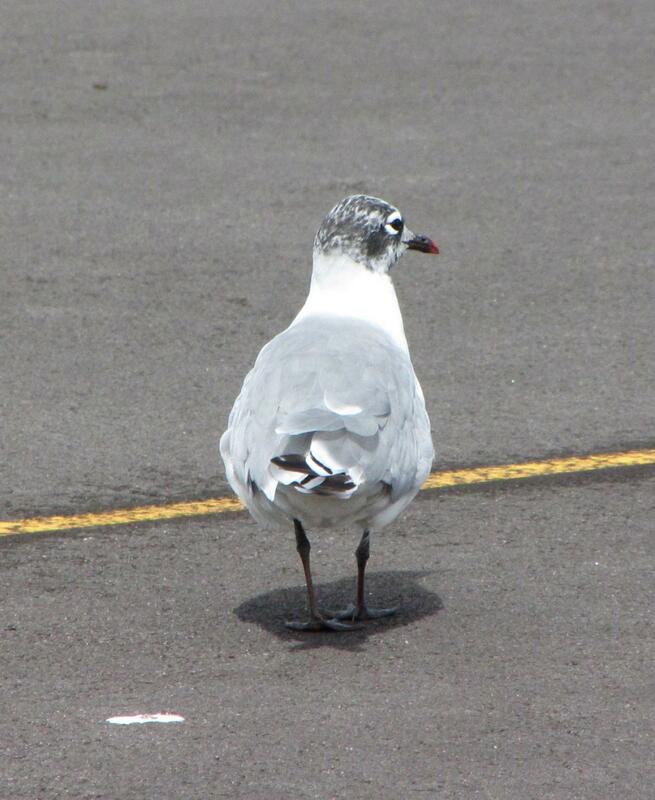 The centre of the tail is pale grey but this is difficult to see. 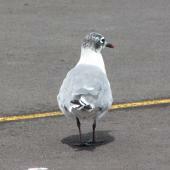 Similar species: laughing gull is larger, with longer bill, legs and wings, and a narrower white eye-ring. 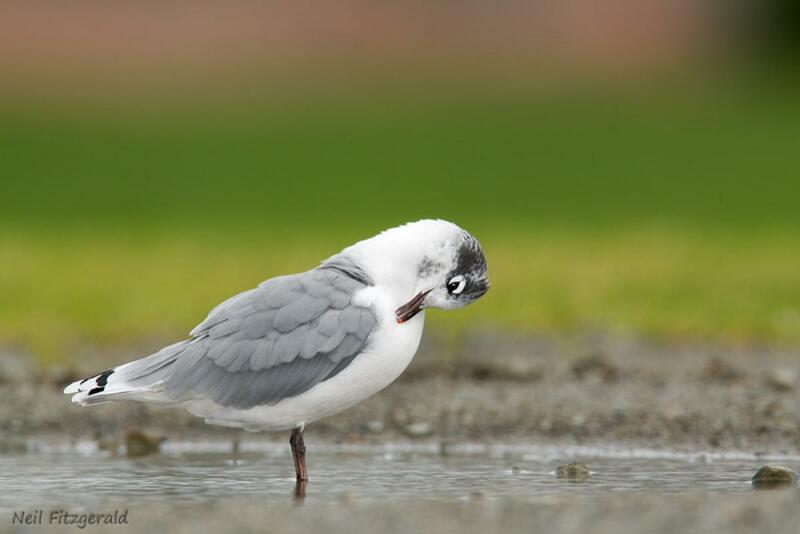 Franklin’s gulls breed in marshes in the prairies of the northern USA and Canada from May to August and migrate south to the west coast of South America from Peru to Chile from November to March. In North America it is usually found inland, in South America it is coastal and ranges out to the Humboldt Current. 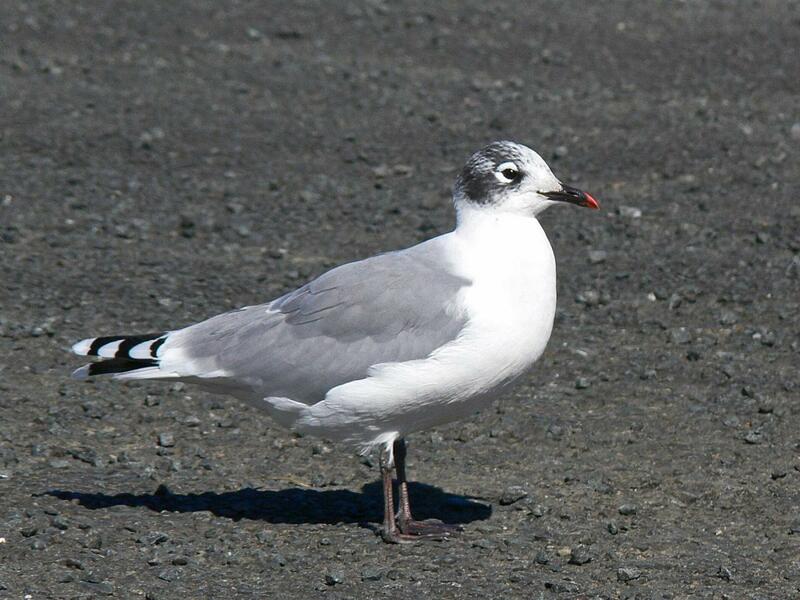 Four records: Raoul Island (Kermadec Islands) July 1988; Tomahawk Lagoon, Dunedin, 2 & 3 July 2002 (adult in full breeding plumage); Manukau Harbour and Papakura, September-October 2009; Tuamarina, Marlborough, July 2013. 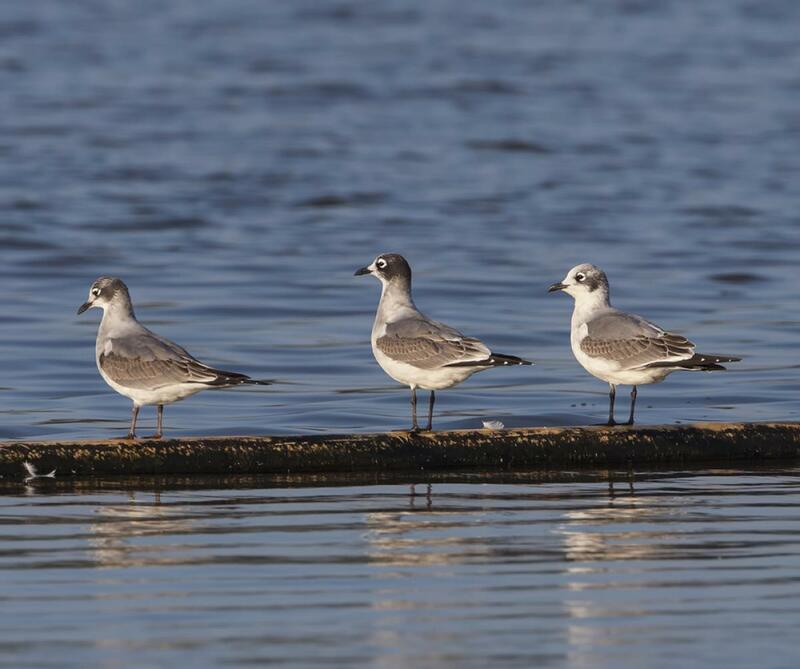 Franklin’s gulls are sociable and will associate with other species of gulls and waders. 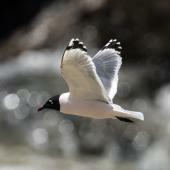 They form dense flocks containing thousands of birds at suitable sites on and off the coast of Chile. 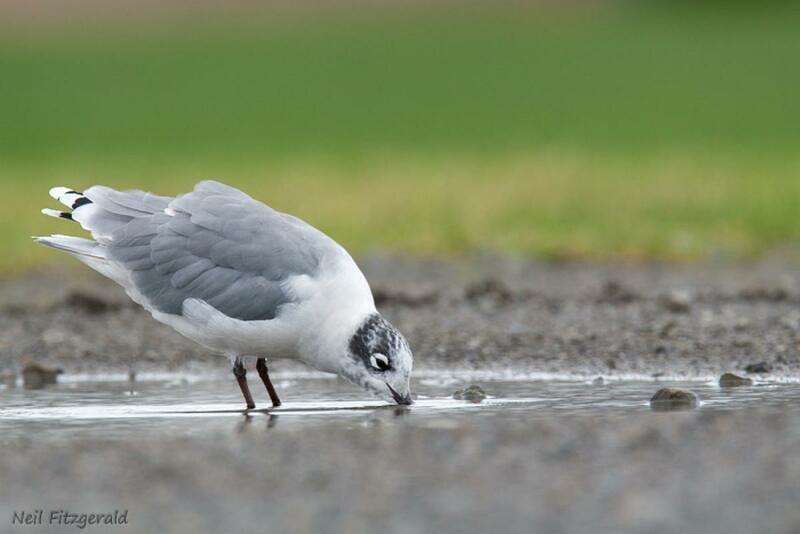 Versatile feeders, Franklin’s gulls mainly take small invertebrates from near the surface of the water while hovering, swimming or making shallow dives. 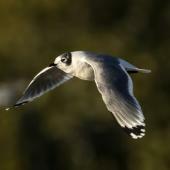 They also feed over land, will scavenge human refuse, and can hawk insects in flight. 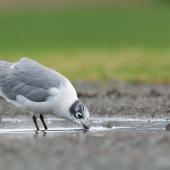 The Papakura bird was often seen taking earthworms from the playing field, and bread from picnickers. Higgins, P.J. ; Davies, S.J.J.F. 1996. 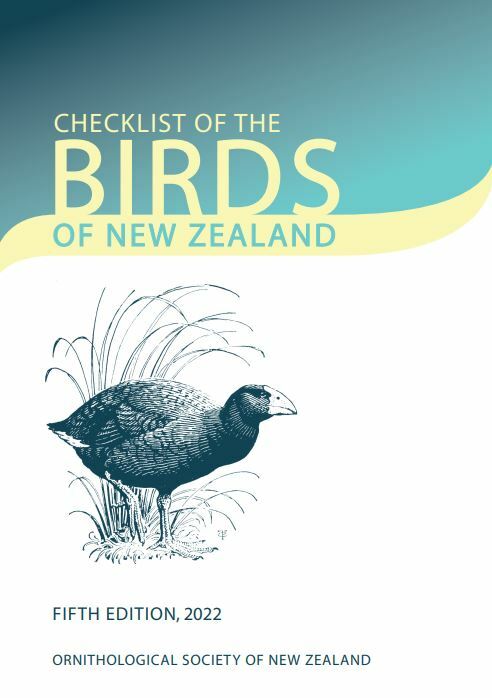 Handbook of Australian, New Zealand, and Antarctic birds. Volume 3. Snipe to pigeons. Oxford University Press, Melbourne. Howell, S.N.G. ; Dunn, J.L. 2007. 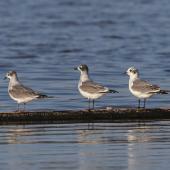 Gulls of the Americas. Peterson reference guides. Houghton Mifflin Company, New York. Miskelly, C.M. ; Scofield P.R. ; Sagar P.M.; Tennyson A.J.D. ; Bell B.D. ; Bell E.A., 2011. 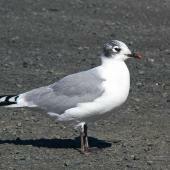 Vagrant and extra-limital bird records accepted by the OSNZ Records Appraisal Committee 2008-2010. Notornis 58: 64-70. Onley, D.J. ; Schweigman, P. 2004. 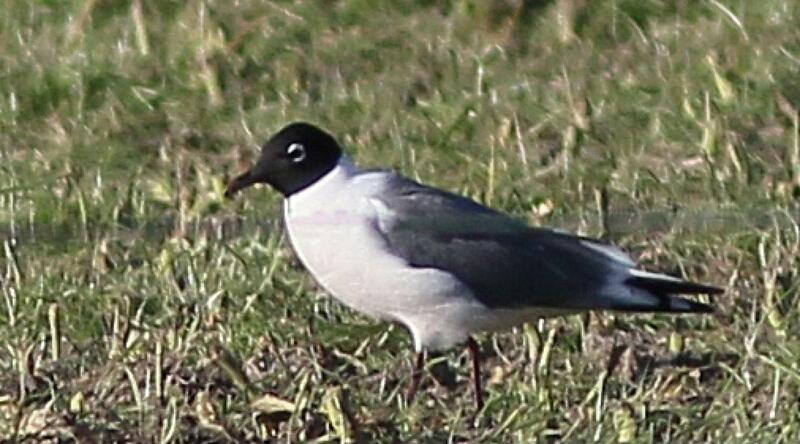 First record of Franklin’s gull (Larus pipixcan) in New Zealand. Notornis 51: 49-50. Veitch, C.R. ; Miskelly, C.M. ; Harper, G.A. ; Taylor, G.A. ; Tennyson, A.J.D. 2004. 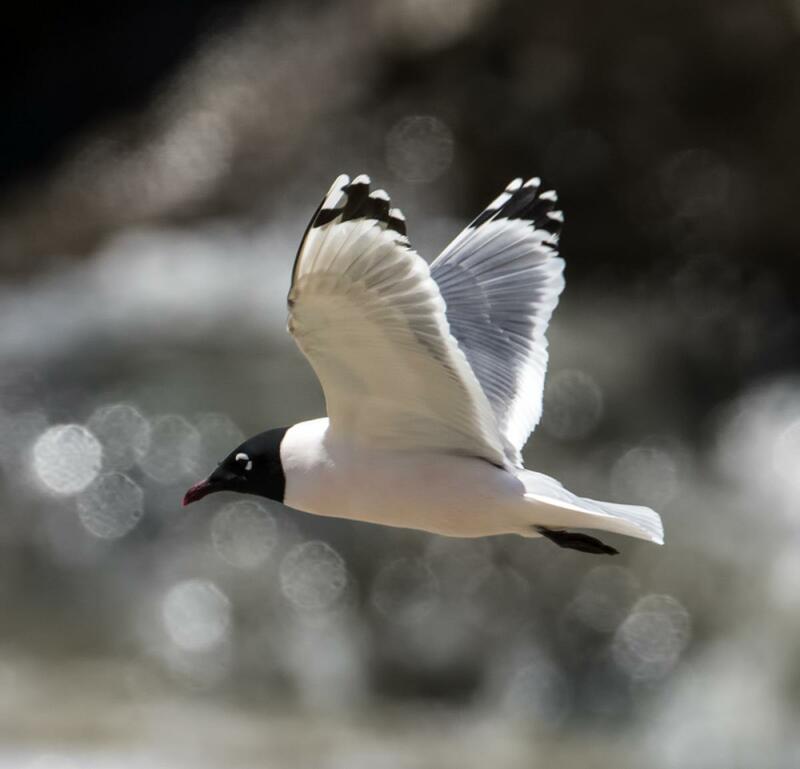 Birds of the Kermadec Islands, south-west Pacific. Notornis 51: 61-90. 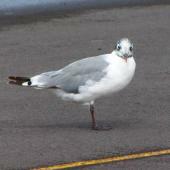 A medium-sized black-and-white gull with black on the head, white neck, breast, belly and underwings, dark slate grey back, blackish legs, and a dark red to blackish bill. 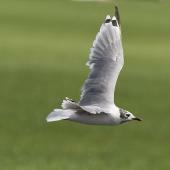 The upper wing surfaces are grey with white trailing edges and a distinctive pattern at the tips.